Finding Song Home is the new sonic bike opera made for Brussels by Kaffe Matthews and the Bicrophonic Research Institute (BRI) with tech development by Tom Keene. 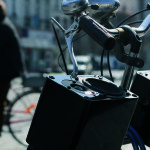 The routes the opera takes pass between La Monnaie plaza, the canal border and Molenbeek squares, re-defining these areas as sonic cyclists can pedal through, songs and narratives recontextualized as they unfurl through the shifting street’s soundscape and Matthews electronic counterparts. With sounds triggered by where and how fast the bike goes, so each participating cyclist can define their own experience. Finding Song Home is the BRI’s 8th sonic bike opera. It was commissioned by La Monnaie du Munt and Q-02 and has also made and developed eight new sonic bikes in Brussels with cyclo. These bikes will remain in Brussels to be used to make and perform new works. Finding Song Home was made through Matthews’ residency with Q-02 and La Monnaie during which she explored the city, met and worked with residents she met through local community groups Globe Aroma and Vaartkapoen, as well as running route composition workshops for children at La Maison des Cultures, Molenbeek with Flemish theatre director, Ivan Vrambout.